Stuart, M E, Wang, L, Ascott, M, Ward, R S, Lewis, M A, and Hart, A J. 2016. Modelling the groundwater nitrate legacy. British Geological Survey Internal Report, OR/16/036. 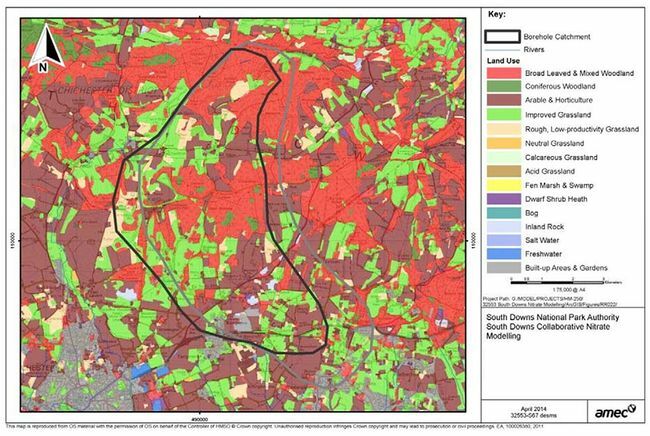 The South Downs Collaborative Nitrate Modelling Project was commissioned by the South Downs National Park Authority. Its purpose was to build a compelling evidence base in support of existing or new initiatives to deliver groundwater quality improvements through sustainable land management in the South Downs Way Ahead Nature Improvement Area (NIA). The work also helps the Environment Agency to meet WFD requirements to improve groundwater quality and tackle rising trends in nitrate. The work was carried out by AMEC (now Amec Foster Wheeler) and funded through the South Downs Way Ahead Nature Improvement Area (NIA), the Environment Agency and the Downs and Harbours Clean Water Partnership. Additional technical support and advice has been provided by Southern Water Services Ltd and Portsmouth Water Ltd. The Eastergate and Westergate public water supply sources operated by Portsmouth Water lie to the north of the village of Eastergate, about 750 m apart (Figure 4.1). The abstractions lie inside the Arun and Western Streams CAMS area and are located in the Chichester Chalk. As part of the South Downs Nitrate Modelling Collaborative Project their catchments have been delineated using the Flowsource tool (© Groundwater Science) and the East Hants and Chichester Chalk (EHCC) regional groundwater model (AMEC, 2014a, b) using actual abstraction rates. The catchments both extend to the north and slightly west from the sources, onto the South Downs. The catchment to Eastergate covers an area of 45.3 km2 with substantial overlap to Westergate and their combined footprint is similar in extent to that of the combined existing SPZ 3. These boundaries are now being updated for Portsmouth Water, based on more realistic longer-term abstraction data. As AMEC used average rate for 2012/2013 only, the final maps produced for Portsmouth Water will be slightly different. Figure 4.1 Borehole catchments of Westergate and Eastergate PWS on solid geology (from AMEC, 2014a). Reproduced by permission of the South Downs National Park Authority. The underlying aquifer comprises the Newhaven and Seaford Chalk, with a small area of Lewes Nodular Chalk close to the sources (Figure 4.1). The sources themselves penetrate the Lambeth Group whilst to the south of the boreholes the catchments extend onto the London Clay. The confinement of the Chalk by the Lambeth Group may provide protection to the underlying aquifer, however this formation is notoriously highly variable over short distances and should not be considered a true aquitard. The Lambeth group and Chalk interface is prone to solution feature formation. The majority of the catchment is on unconfined Chalk. The depth to the water table is estimated to lie in the range 20–30 m in the southern part of the catchment, increasing to over 100 m in the northern part. The Eastergate catchment contains significant areas of woodland (44% of the area), particularly in the central and northern parts of the catchment (Figure 4.2). A further 24% of the catchment is under arable land, and 22% under improved grassland or rough grazing. 3% of the catchment is urban. There are small areas of field vegetables in the catchment (0.4–0.5%). Manure heaps and slurry stores associated with livestock enterprises. The receptor in this case study is the Eastergate public water supply. Figure 4.2 Landcover map for the Westergate and Eastergate catchments based on CEH (2011). Nitrate concentrations at Eastergate are high, and have exceeded the Drinking Water Standard (DWS) of 50 mg NO3 l-1 in 1994, 1995, 2001 and 2002. Concentrations also show marked seasonal variation, with peaks occurring in the winter and spring. Eastergate also had DWS failures in 2013, 2014 and 2015, all between May and September, due to nitrate. 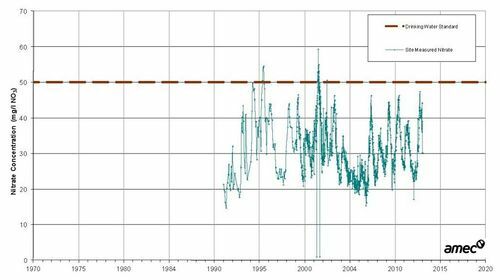 Concentrations also show an overall slightly rising trend over the period of measurement but with periods of stronger upward trend, e.g. 1992–1996 and 2005–2013) and also periods showing a downward trend, e.g. between 2000 and 2005 (Figure 4.3). The more recent data indicate an upward trend. Figure 4.3 Pumped water quality at Eastergate PWS. Reproduced by permission of Portsmouth Water. Nitrate is leached from the soil zone based on landuse and soil type. Crop rotations are implicitly represented by historical arable and improved grassland nitrate leaching trends which were constructed from empirical information — historical fertiliser usage, livestock density and porewater profiles and adjusted using observed nitrate concentrations in a number of other catchments. Water (and nitrate) moves by piston flow through the unsaturated zone at a rate controlled by recharge and effective chalk porosity. By pass flow was not considered, although it may well be important in this karst chalk setting close to the edge of the Palaeogene. Water moves through the saturated zone to the abstraction point as defined by the catchment flow modelling. Abstraction rates and regime at the source have stayed the same over the modelled period. Any attenuation of nitrate is not significant enough to be modelled. The presence of Superficial and Palaeogene cover will provide some attenuation but the volume is assumed to be negligible compared to the water from the unconfined aquifer. Topography for use in depth to water calculations was taken from the OS panoramic topography layer (1:50 000). Dominant soil type was based on the National Soil Map of England and Wales — NATMAP. Historic groundwater levels for a number of observation boreholes were supplied by the Environment Agency. Arable and improved grassland leaching were estimated over the period 1900 to 2012 using CEH Land Cover Map 2007 and arable changes, with other landuses — semi-natural vegetation, woodland and urban areas assumed to remain constant. Infiltration to the Chalk was based on the long term average values from the 4R recharge model (AMEC, 2014b). In the nitrate trend model unsaturated zone and saturated zone travel time to the abstraction are calculated based on unsaturated zone thickness and porosity and this was used to back calculate the starting nitrate concentration for the year the water left the soil zone for each grid square based on the soil zone and landuse. Unsaturated zone moisture content for the Chalk as a proxy for effective porosity was initially assumed to be 30%. Long term trends were calculated for the period 1945 to 2012 based on soil leaching trends and the unsaturated zone delay. Observed nitrate data at the abstraction point were used to calibrate the model. Seasonal fluctuations in nitrate concentrations have been simulated using water level data from a nearby observation borehole. Short term ‘spikes’ in nitrate concentration are not simulated by the trend models. The trend model generally provides a good fit to observed nitrate concentrations at Eastergate (Figure 4.4), including the rising trend in the 1990s and, to some extent, simulation of the temporary drop in nitrate concentrations between 2003 and 2006. 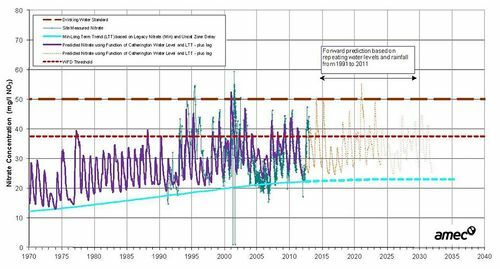 The model does not simulate the spikes that exceeded the Drinking Water Standard (DWS) in 1996 to 2003. Figure 4.4 Forward prediction of nitrate at Eastergate PWS assuming baseline leaching scenario and including point source contributions. Reproduced by permission of Portsmouth Water. Under the baseline scenario (assuming current leaching rates continue), the model predicts that the underlying trend will result in nitrate concentrations continuing to slowly rise before levelling off by about 2030. Seasonal variations in concentrations linked to fluctuations in water level may continue to cause occasional failures of the DWS at the sources, however, and spikes caused by rapid recharge events (not simulated by the model) are likely to cause additional failures. There is a large spread in ages of water at Eastergate, from 5 years to over 100 years’ time of travel (Figure 4.5). Much of the younger water (less than 30 years) derives from arable land. Under the baseline leaching scenario the model predicts that nitrate concentrations will occasionally exceed the DWS until about 2024. 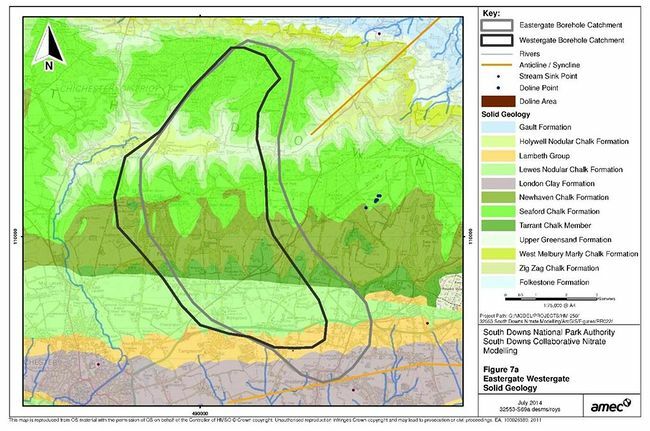 Figure 4.5 Age of water at Eastergate based on unsaturated zone time of travel at low water level (from AMEC, 2014a). Reproduced by permission of the South Downs National Park Authority. The majority of nitrate reaching the water table originates from arable land and agricultural (improved) grassland. It is predicted that the impacts of catchment management could take some years to significantly reduce nitrate concentrations in pumped water. However, management of nitrate inputs in the area close to the boreholes could help to reduce the frequency and severity of spikes in the shorter term, and this could reduce the need for treatment or blending. There may still be spikes from further away reaching the borehole by karst flow. It is predicted that spikes in nitrate concentration in excess of the Drinking Water Standard will continue to occur until about 2024. This is currently being addressed by the water company through blending with lower nitrate sources to ensure that drinking water meets the required standard at customers’ taps. The annual average nitrate concentration is currently at or below the WFD threshold of 37.5 mg NO3 l-1 and is not predicted to increase. However, the thick unsaturated zone in much of the catchment suggests that the impact of the peak in fertiliser use in the 1980s will not arrive at the source until approximately the 2030s, and the large distribution of ages of water will result in a slow decline in nitrate concentrations after this time. The AMEC approach to the modelling of the unsaturated zone is very similar to that in the BGS NTB model. The inclusion of this component allows the nitrate trend to be effectively modelled and for the model to be used to make realistic predictions of the impact of future improvements in nitrate management. The inclusion of the unsaturated zone travel time allows the association of woodland in the upper part of the catchment with long travel time water as shown in Figure 4.5. 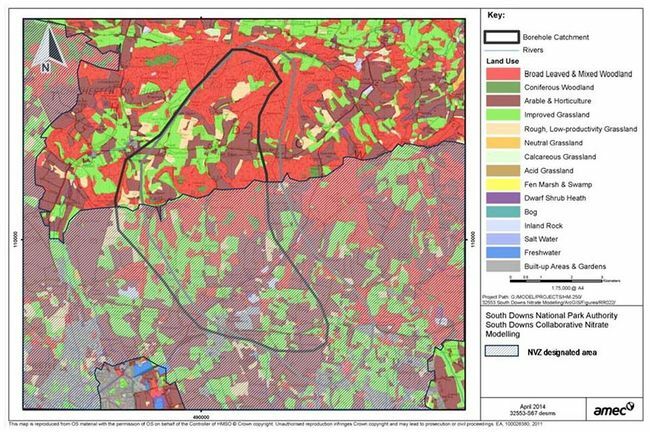 This provides a ready view of the location of the arable/improved grassland areas of the catchment where travel times are shorter and which will respond more rapidly to changes in nitrate management. The estimation of nitrate leaching used here provides an alternative to the ADAS NEAP-N model. The modelling work could potentially be used to inform a future NVZ designation process. The upper part of the modelled catchment is not currently an NVZ (Figure 4.6). Although the majority of the upper catchment is woodland there is also some arable land and due to the unsaturated zone thickness and the consequent age of the water, the peak from this part of the catchment may not yet have arrived. The legacy from the northern part of the catchment and the effect of current activities in the future should be considered in the designation process, although due to the woodland component and the size and geology of the catchment it may be small in this particular example. Figure 4.6 Relationship of catchments and most recent NVZ designated areas. Reproduced by permission of the Environment Agency. ↑ 1.0 1.1 1.2 AMEC. 2014a. Eastergate and Westergate Technical Note 1 AMEC Environment and Infrastructure UK Ltd.
↑ 2.0 2.1 AMEC. 2014b. South Downs collaborative nitrate modelling. AMEC Environment & Infrastructure UK Ltd, Report to South Downs National Park Authority. This page was last modified on 4 May 2017, at 09:56.